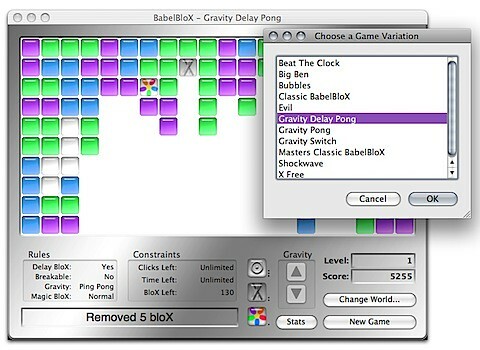 illumineX is giving away free games for Mac OS X -- something in the range of 20,000 licenses to BabelBloX as part of a MacHeist promotion this week. Sign up at MacHeist, where you can join the MacHeist missions and get lots of cool free software for Mac OS X, including BabelBloX. When you get your "loot", you'll be able to unlock all of the games in BabelBloX (which presently contains 11 different games, based in the same universe of colored, shattering or popping blocks of glass). Press the "Change World..." button to switch to a different game world. Enjoy playing BabelBloX. If you like it, please blog about it and link back to our site.